I can't believe that a week has passed since IIW8 ended. I was planning on writing a wrap-up blog post then and time has just slipped away. When we were planning for this IIW, we were pretty worried about whether people would come and whether we'd get sufficient sponsor support. As it happened, things turned out fine. We had more people than ever--about 180. And while some sponsorships went unsold, overall we had great support for which we're grateful. The workshop itself was one of the best ever. There was a lot of energy in the various sessions and people came prepared to solve problems. For example, I remember one session that Joseph Smarr of Plaxo ran on API keys. People from Plaxo, Google, Facebook, Microsoft, Myspace, and others were in the room throwing out ideas and working together to come up with a generalized method. We started earlier this time (Monday morning instead of the afternoon) and the extra time seemed to be all used up. I expect we'll do that again. We didn't give away Android phones, but there was a lot of good food, good conversation, and the "thank-you" circle at the end is not to be missed. Kaliya did a great job with the program, as usual. I can't say enough good about how she creates workshops that generate community. Drummond and I ran a session on action cards--information cards that create action and I followed that up with a demoinstration of using Kynetx to create action cards. We have a private beta of our developer tools going on. If you're interested in participating, let me know and I'll send you the signup URL. 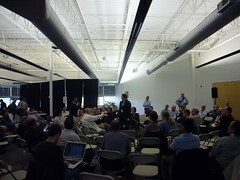 The next (ninth) IIW will be November 3-5. Get it on your calendar now. If you're interested in identity, IIW is not to be missed.